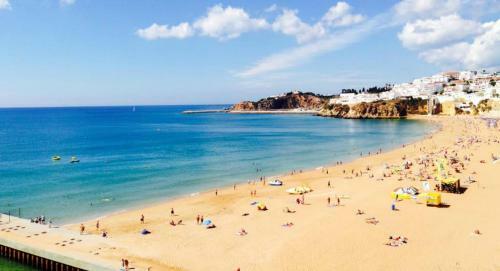 This 4-star resort offers apartments on the hills overlooking Albufeira’s old town. The resort boasts a lagoon-style pool on a terrace with Atlantic Ocean views, and an extensive wellness centre. Offering an outdoor pool and a green garden, Vila Rosal, Sao Rafael is located in Albufeira, just a 3-minute drive from scenic São Rafael Beach. The Albufeira centre is 6.4 km away from the home. Set in Albufeira, Akisol Albufeira Aqua is 6 km from Oura Beach. The Strip - Albufeira is 6 km from the property. The accommodation has a dining area and seating area with a TV. There is also a kitchen, equipped with a microwave. Located in the heart of Albufeira, DU4ARTE hostel is just a 2-minute walk from well-known beaches like the Pescadores and Peneco.